The Jeep Cherokee raises the bar with the New 2014 model. Newly equipped with Jeep Selec-Terrain traction control system, this allows drivers to select up to five various terrain modes for maximum grip levels on pretty much any surface. In addition, the 2014 Jeep Cherokee is the first SUV to feature a nine-speed automatic transmission, enabling it to achieve an impressive 31 MPG on the highway. The fuel mileage is one thing, but the Jeep is also very powerful, and boasts best-in-class V-6 towing numbers as a result. The Cherokee also goes back to Jeep's roots with trail rated capability that made the Jeep brand what it is today. The 2014 Jeep Cherokee is powered by Chrysler Group's 16-valve, 2.4-liter Tigershark MultiAir 2 I-4 engine, which comes standard in the 2014 Jeep Cherokee. The 2.4-liter Tigershark engine delivers an EPA rating of 22 city/31 highway/25 combined for 4x2 models. The engine produces 184 horsepower and 171 lb.-ft. of torque and offers drivers a driving range on a tank of gas of nearly 500 miles. The available 3.2-liter Pentastar V-6 engine is the first descendant of the celebrated 3.6-liter Pentastar V-6, named one of Ward's 10 Best Engines three years consecutively and counting. The available 3.2-liter Pentastar V-6 engine benefits from the same innovations that earned its larger displacement predecessor industry-wide acclaim for efficiency, power and refinement. Fluid, sleek exterior design cues highlight the efficient, wind-splitting upper body of the Cherokee. The rugged, protective lower body conveys the legendary capability that is a characteristic of every Jeep. The available award-winning 8.4-inch touchscreen multimedia command center, the largest in the segment, or the standard 5-inch touchscreen multimedia command center are attractive, intuitive, and is located in the center stack. 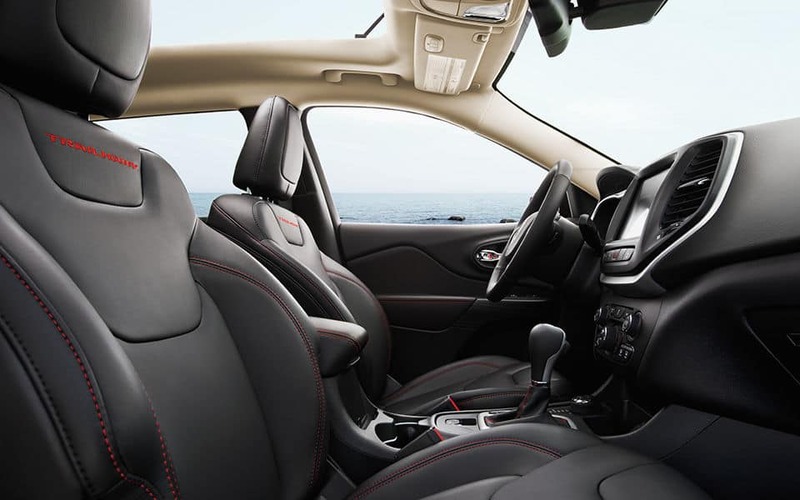 The 2014 Cherokee, equipped with the Uconnect system, enables the driver to control the audio, climate, heated/ventilated seats, and much more from the touchscreen, easy-to-use controls located on the center stack below the touchscreen or with voice commands. The touchscreen buttons are larger and easy-to-see at a glance, making it easier for drivers and passengers to learn controls easily and effectively. The renowned Cherokee name returns to the Jeep vehicle lineup for the 2014 model year. The resulting SUV, the 2014 Jeep Cherokee completely redefines the mid-size SUV segment, delivering legendary Jeep 4x4 capability, a segment-first nine-speed automatic transmission, fuel economy improvements of more than 45 percent, superior on-road ride and handling, a cutting-edge, revolutionary design, world-class craftsmanship, class-exclusive technology, and more than 70 advanced safety and security features. The Jeep Cherokee is set to delight consumers both on the road and on the trail. 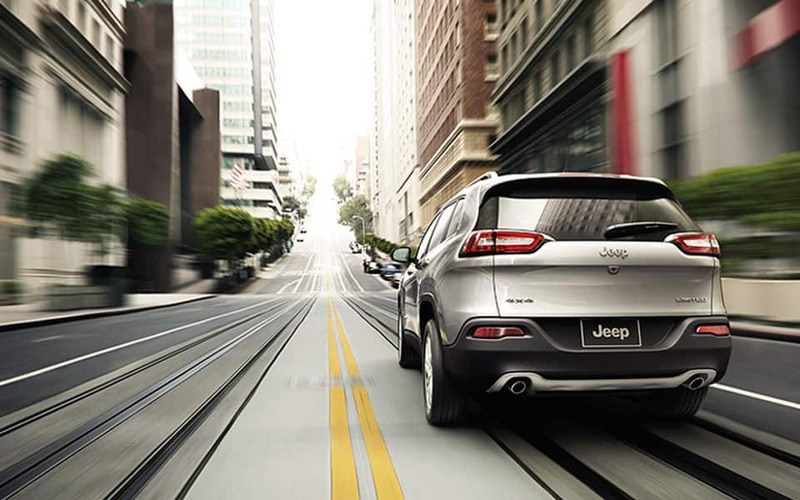 For more information, or to test-drive a 2014 Jeep Cherokee, call us today!